This book has beautiful photography, and beautiful text by a man who is of the Maasai Tribe. Tepilit Ole Saitoti’s commentary and insight into his people really make the photographs come to life (the cover photograph is of the author’s brother). This is not so much a book as it is an experience, aided by its “over-sized” coffee table format book that gives you the feeling of “stepping” into the beautiful Kenyan landscape. Reading this beautiful book is the next best thing to being able to visit this beautiful land and see these fascinating people in person. Carol Beckwith was born and educated in the United States. Winner of a Boston Museum Traveling Fellowship, she studied fine arts in Japan and New Guinea. Arriving in Africa in 1974, she traveled the continent, living with the Maasai of Kenya and Tanzania, and the Wodaabe of Niger. 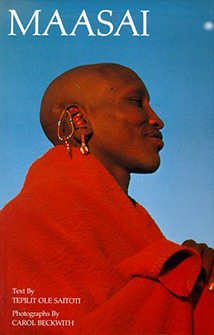 Her unique experiences led to two acclaimed photographic books, Maasai (with Tepilit Ole Saitoti, 1980), and Nomads of Niger (with Marion van Offelen, 1984), which became the subject of her award winning film, Way of the Wodaabe (1988). Her third book, African Ark (1990) was co-authored with Angela Fisher and led to the film The Painter and the Fighter. Carol’s photographs and paintings have been exhibited and published in the U.S., Europe, Japan and Africa. The author of Maasai, Tepilit Ole Saitoti now offers his life story: from his birth into a traditional society in Tanzania in 1949, through his youth, education in a mission school, and initiation as a warrior, to his career as a game park guide and ranger (subject of a National Geographic film, Man of the Serengeti); to his studies in Munich and Boston and at the University of Michigan (where he received an M.S. in natural resources), to his return home, to be received back ritually into his family.